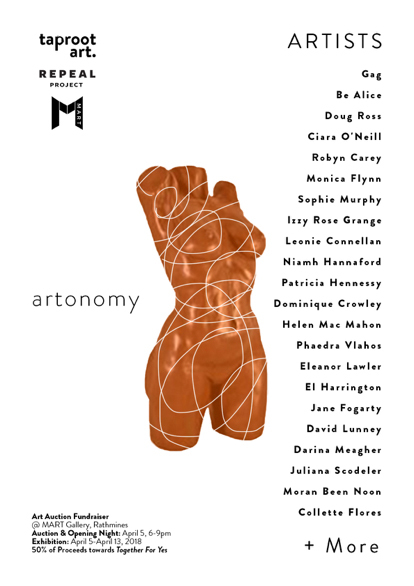 I don’t normally review exhibitions before I see them, but one I’m really looking forward to this week is the ‘Artonomy’ exhibition and auction at MART Gallery in Rathmines, Dublin 6. 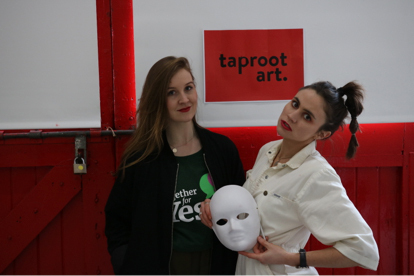 The exhibition has been curated by Sophie Murphy of Taproot Art in conjunction with MART Gallery and studio members. One gallery will feature works from artists invited by MART, and the second gallery will feature Mask, a series of works drawn from the female form. A live auction of the works will take place at the opening at 6pm on Thursday 5 April, with 50% of sales donated to Together For Yes. Sure, I’m biased, because I have work in it, but I’m also really looking forward to seeing the huge range of work that will be on show from 32 other Irish and international artists, the musical performances by Eve and Frank Sweeney, the coffees, the drinks and the people. But mostly I’m looking forward to doing my part in raising funds for Repeal and the Together for Yes campaign. As an immigrant, I’m subject to the laws of this country while simultaneously having no say in how they’re formed. I’m not allowed to vote in May’s referendum to repeal the Eighth Amendment, but I can attend a night of fun filled with great art and excellent company while we all do our best to raise funds and make change. Artonomy opens 6-9pm on 5 April and runs until 13 April 2018, Monday-Saturday 1-6pm at The MART Gallery, 190a Rathmines Road Lower, Rathmines, Dublin 6. Leonie Connellan was born in Australia during the week that NASA’s Voyager 1 spacecraft made it’s closest approach to Jupiter. She has two BAs and an MFA in Printmaking from RMIT University in Melbourne, and makes art about science and storytelling. She moved to Dublin in 2017 with her husband and dog.